The Star published this story on June 26, 2011. As the monster tornado bore down on them, Rusty Howard and his two small children sought refuge in a Home Depot store. But instead the young father, the children and four other people died when the roof came off and the walls came down, crushing them beneath a 100,000-pound concrete panel. Within seconds the entire structure collapsed in a heap of concrete slabs, metal trusses and roofing. At least 28 other people survived, huddled in an un-reinforced training room in the back of the building. Indeed, some engineers interviewed by The Star said building codes for big-box stores need to be strengthened, or the stores should have internal storm shelters when they’re built. In tilt-up wall buildings, the structures are erected with concrete walls that are poured on site and lifted into place with cranes. The walls are held upright by critical connections to a relatively lightweight roof system. Under high winds, the roof can become compromised, and the panels in tilt-up wall buildings can fall like dominoes, said Larry Tanner, a tornado expert and part of a team of engineers who traveled to Joplin to study the Home Depot collapse and other building failures for the Federal Emergency Management Agency. If the building code had required the Home Depot store to have stronger roof-to-wall connections, it might have sustained less damage, even in such heavy winds, said Tanner and other engineers interviewed by The Star. Noting that they had never before lost a store to high winds, Home Depot officials defended the tilt-up wall design, which they’ve used in hundreds of their nearly 2,000 stores across the country, including several in the Kansas City area. They said their engineers “fundamentally disagree” with Tanner and his colleagues. Home Depot officials told The Star they were so confident in the tilt-up wall design that they would use it again when they rebuild in Joplin. A few days later they said they’d use a different design: smaller precast walls made elsewhere and trucked to the site. The new design is similar to tilt-up construction but will allow quicker completion and still meet local building codes. “This year I have seen so much carnage, and so many people who died who did not need to die. These strong tornadoes are no match for those kinds of safety rules,” Marshall said. As the storm approached and sirens sounded across the city, employees at stores near 20th Street and Range Line Road in Joplin began moving customers into their stores’ safe areas. Across 20th Street from Home Depot, at least three people died when a portion of a Walmart store collapsed. But an estimated 200 others survived, largely because many of them were taken to a concrete block structure inside the store, Walmart officials said. Home Depot employees closely followed the store’s disaster protocols, according to company officials. They listened to a weather radio, manned the doors and swept the store looking for shoppers who needed shelter. They also directed customers to the designated “safe area,” the training room in the back of the building. Unlike Walmart, it wasn’t a concrete block structure. Employees then locked the store’s front doors.That appears to be standard procedure at large stores. Home Depot officials said it’s done to keep wind from entering the building and forcing the roof system upward, and to ensure that everyone is accounted for and safe. The Howard family had been out to dinner that afternoon. Edie Howard left in one car while her husband and children drove off in another. Just before the tornado struck, Rusty Howard talked with Edie by cellphone in his car, according to their pastor. Rusty, 29, told her that he and the children were headed for the nearby Home Depot to take shelter. About that time, Home Depot employee Dean Wells, 59, of Webb City, Mo., saw several people, including Rusty and his children Harli, 5, and Hayze, 19 months, trying to get in the store’s locked front doors. Wells went to let them in. But before any of them could make it to the training room, the roof flew off, and the walls collapsed on top of Wells and the Howards, plus Randy England, 34, of Granby, Mo. ; Dennis Osborn, 34, of Seneca, Mo. ; and one other person. All were killed. 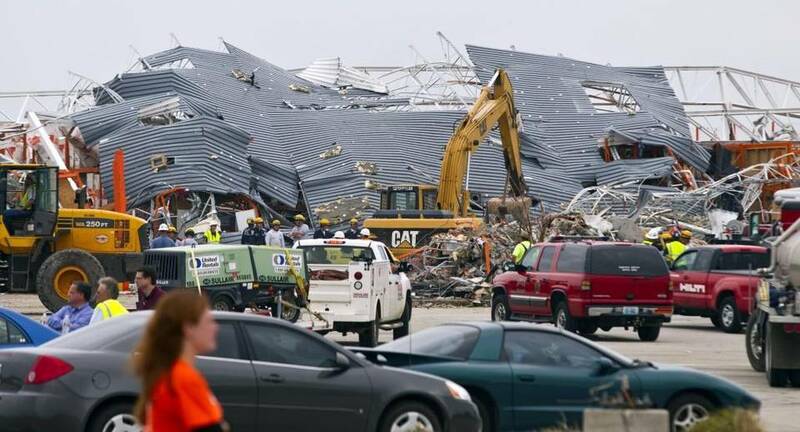 The Joplin death toll stands at 156, making it the United States’ single most deadly tornado in 60 years. The tornado cut a three-quarter-mile wide swath through the city, destroying an estimated 8,000 homes and more than 500 businesses. The same forces pushed the eastern rear wall — near where the 28 survivors were huddled — toward the outside of the building, an event that probably saved many of them from worse injuries or death, according to engineers and rescue workers. But Lischka said the collapse actually began when the oncoming tornado — much like a vacuum cleaner — created huge upward forces on the roof. At that point, Lischka said, the inside bar joists supporting the roof began to bend and pull away from the concrete walls. In fact, he said, the forces were so strong that three-fourths-inch-diameter metal anchors for the joist connections — which were embedded inside the concrete walls — bent and were literally pulled out of the hardened concrete. By the time it was over, only two short wall panels were left standing, and the store’s metal roof support system was sprawled in a mangled heap behind the store and across its interior. But that doesn’t appear to be the case in Joplin. “The Home Depot was all on the ground, except for one corner,” said Joplin Fire Chief Mitch Randles. “Academy Sports’ roof is missing, but their walls are still standing, and most of what was missing at the Walmart was the roof,” Randles said. Randles said authorities may never know where every victim was when the tornado hit. But he confirmed that at least seven people died inside Home Depot and at least three died inside Walmart. Academy Sports officials said there were no deaths at their store. Walmart spokesman Lorenzo Lopez said the company used tilt-up wall designs at some stores but more often used reinforced concrete block walls, like those at the Joplin store. Lopez said the Joplin store’s safe area, where he estimated 200 people survived, was a concrete block structure containing break rooms, rest rooms and a customer service area. He said the structure is not near an outside wall. “We are very fortunate in terms of the impact on lives that it could have had,” Lopez said. He added that, given its internal concrete block structures, it is unlikely Walmart would add a separate storm shelter when it rebuilt. “Walmart only had a catastrophic failure in one part of their store, but Home Depot was bad,” said Tanner, who studied the debris in Joplin as part of a mitigation assessment team sent by FEMA. Tanner said his team’s final report probably would rate the Joplin tornado at less intensity than earlier estimates. They think it was an EF-4 (wind speeds of 168 to 199 mph), not an EF-5 (200 to 234 mph). “We just need to do a better job of supporting that (roof-to-wall) system,” he said. Home Depot officials declined to specify the cost difference between lightweight roofs like the one used in Joplin, and heavier concrete roofs used in hurricane-prone areas such as South Florida. In a report on the “Super Tuesday” tornadoes that struck Alabama, Arkansas, Kentucky and Tennessee in February 2008, Tanner and his colleagues found that tilt-up wall buildings failed under much lower wind speeds — 110 to 167 mph — than those that slammed into Joplin’s Home Depot. “There are lots of different ways buildings can fail, but a consistent problem (with tilt-up failures) is the loss of roof connections, and we see that time and time again,” said John Snow, a meteorologist and dean of the college of atmospheric and geographic sciences at the University of Oklahoma. Several engineers who were part of a different team sent by the American Society of Civil Engineers to assess the damage in Joplin also agreed with Tanner’s assessments on tilt-up structures. “There is no huge smoking gun here,” said Dave Weber, an engineer with Allstate Consultants in Columbia, Mo., who was in Joplin to advise rescue workers. Jim Baty, technical director of the Tilt-Up Concrete Association in Mount Vernon, Iowa, said tilt-up wall construction had been around for decades, but it got much more popular when it became easier to move concrete trucks and cranes to construction sites. He said that he was aware of Tanner’s work on tilt-up structures but that he hadn’t evaluated Tanner’s conclusions. A Florida newspaper suggested after the Joplin disaster that it might be time for tornado-prone states to study the costs and benefits of standardizing and beefing up their building codes the way Florida did after Hurricane Andrew in 1992. Buildings in parts of Florida require structures to withstand 150-mph winds, while most of tornado alley has only a 90-mph standard. Codes in Missouri vary from city to city. The insurance industry, which is paying out billions of dollars this tornado season, is backing such changes. The ASCE said in its interim report that building-code improvements now required in hurricane country would help in tornado-prone areas with winds of up to 135 mph, dismissing “myths” that tornado-resistant buildings couldn’t be constructed. But it doesn’t appear that’s going to change codes anytime soon in tornado alley. Although the issue came up recently in Oklahoma, it might go no further there than incentives for building storm shelters. And as Florida discovered, codes that are too strict could mean higher building costs that will discourage construction even further. There’s also the added complication that strengthening structures for the straight-line winds of a hurricane is much simpler than bolstering them against wildly unpredictable tornadic winds. At a recent work session, Joplin City Council members said they might require relatively inexpensive changes to the local building code, such as “hurricane clips” (metal reinforcing to better hold a home’s roof to its walls) and beefed-up concrete block foundations. But they have indicated they will not require any major code changes, such as requiring storm shelters, arguing they did not want to institute requirements that would be costly to homeowners or drive businesses to other nearby towns. If Missouri had a statewide building code such as the one in Florida, those concerns would diminish. But two such proposals suffered quick defeats recently in the Missouri General Assembly. The idea has been discussed at recent meetings of the Interim Committee on Disaster Recovery, led by state Rep. Shane Schoeller, a Willard Republican. But the idea isn’t likely to go any further. Gov. Jay Nixon said shortly after the tornado that what happened in Joplin would prompt consideration of stronger building codes and other measures designed to protect the public. But Nixon questioned whether codes could be written to prevent the horrific destruction witnessed in Joplin. So what’s left is what Tim Marshall, the meteorologist and engineer from Texas, called acceptable risk. “It’s acceptable risk in the center of the country. We are at the mercy of building codes, and that is 90-mph winds, and anything above that, all bets are off,” he said. Until codes are upgraded, Marshall and other engineers said, Home Depot and other big-box stores should build hardened storm shelters inside their facilities.